Pens and paper for recording details. 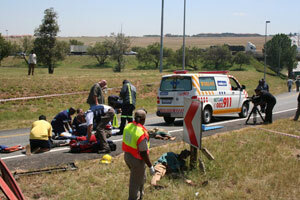 If you are at a crash scene and are able – use your kit and / or a cellphone to take as many photos / videos as possible. Remember – the victims are dead and have no voice or rights in South Africa. You need to act as their voice and assist in the case. Driver of the vehicle. If they are still at the wheel take a picture to confirm this. Video the state of the driver – slurred speech, behaviour, how are they walking? The registration number of all cars involved, as well as the licence disc numbers. Where the point of impact was- glass on the street, skid marks, oil marks, etc. The surroundings – road signs, state of the road, street lighting, weather conditions. Try and show these with the cars in position. Damage to both vehicles ? Any other damage – such as to poles, shop windows, walls, etc. Take pictures of all those involved, including witnesses. Who was in which vehicle? Visible injuries to those involved. Where bodies landed. If bodies were removed – take photos of blood stains to show where they landed. What ambulance took which patient to what hospital. SAPS members on scene could try to pitch you something like – “If we open a drink driving docket the insurance could take long”. This will be in a “Fender Bender” with no injuries to both parties. Be aware that you have the right to say you want a case to be opened. If they will not do so tell them you will report them to the I.C.D – Independent Complaints Division ofthe Police. The legal procedures by the police are governed by the severity of the crash. With serious injuries or death, generally blood tests are taken. It would be advisable to have a breath test done as well, as the results are immediate. If the breath alcohol level is very high a District Surgeon should also be seen to certify about the level of intoxication – and to certify that this would impair driving skills. At the crash scene the SAPS Officer must arrest the driver, open a case, complete a SAPS 308A form for the blood test, and give the form to a doctor or registered nurse at any hospital, or a district surgeon. This must be done within 2 hours from the crash. The medical personnel do not have the right to refuse to take a blood test if they are given the SAPS 308A form. If they refuse, they can be arrested.